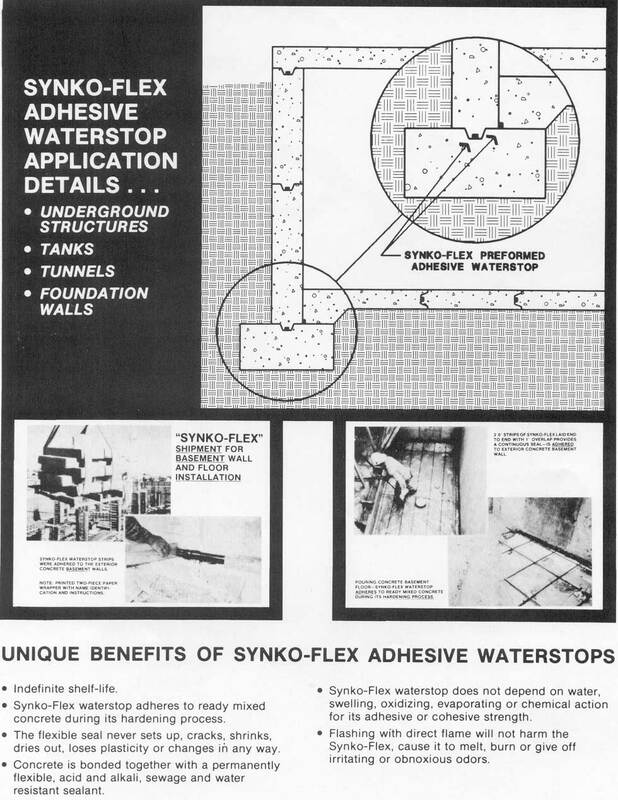 * Synko-Flex waterstop adheres to ready mixed concrete during its hardening process. * The flexible seal never sets up, cracks, shrinks, dries out, loses plasticity or changes in any way. * Concrete is bonded together with a permanently flexible, acid and alkali, sewage and water resistant sealant. * Flashing with direct flame will not harm the Synko-Flex, cause it to melt, burn or give off irritating or obnoxious odors. Description: What is Controlled Expansion? Unlike many of the traditional clay-based products, Southern's Water-Tile Waterstop will not expand to a point that the Waterstop itself is destroyed. In-field experience has proven that products which continually expand lose much of their structural integrity and begin to wash away when subjected to a constant flow of water. The controlled expansion properties engineered into Water-tite Waterstop reduce the internal pressures created in cast-in-place applications. Internal pressures can cause spalling in foundations and wall structures. Water-tie comes packaged 6 rolls per carton; 100 LFT. 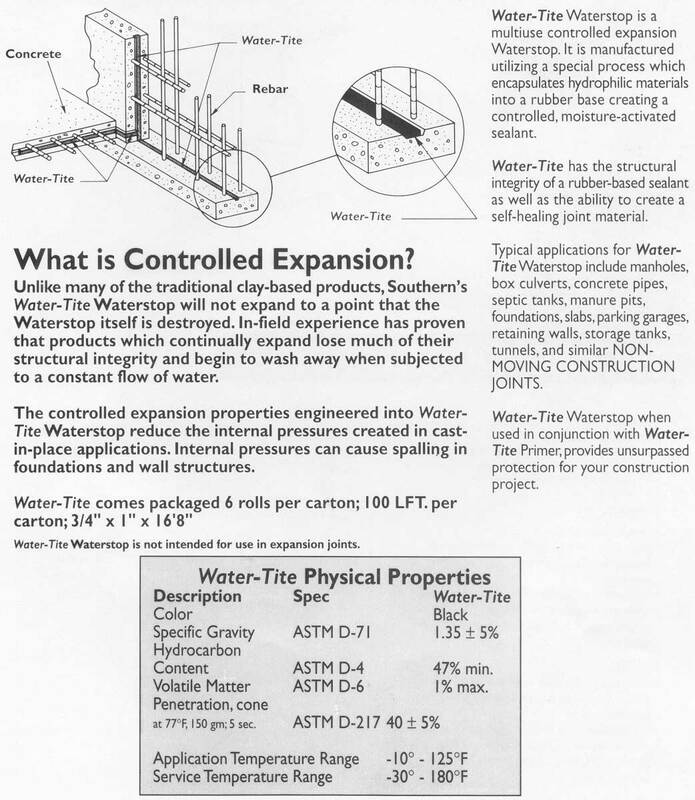 per carton; 3/4" X 1" X 16'8"
Water-Tite Waterstop is a multiuse controlled expansion Waterstop. It is manufactured utilizing a special process which encapsulates hydrophilic materials into a rubber base creating a controlled, moisture-activated sealant. Water-Tite has the structural integrity of a rubber-based sealant as well as the ability to create a self-healing joint material. Typical applications for Water-Tite Waterstop include manholes, box culverts, concrete pipes, septic tanks, manure pits, foundations, slabs, parking garages, retaining walls, storage tanks, tunnels, and similar Non-moving construction joints. Water-Tite Waterstop when used in conjunction with Water-Tite Primer, provides unsurpassed protection for your construction project.